Veteran broadcaster Peter Alliss first played The Open at Hoylake aged 16 and in 2018 remains a key part of the BBC commentary team – 71 years later. The 87-year old Alliss once more takes his place on the commentary team for the 2018 Open at Carnoustie in Scotland alongside Ken Brown, Andrew Cotter and Maureen Madill, with lead presenter Eilidh Barbour again juggling studio presentation, links out on the course and voiced openings in the edit for TV broadcast. BBC Sport is providing extensive coverage of the 147th Open Championship across television, radio and online. On television, BBC Two broadcasts two hours of highlights every day from 20:00-22:00 BST. On radio, BBC Radio 5 live and sports extra provides live coverage of all four days. The BBC Sport website has extensive coverage of The Open across all four days of competition and beyond, in the form of live pages, integrating radio commentary, news and feature pieces and video. 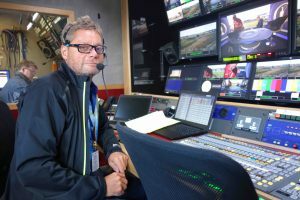 Executive Producer Jonny Bramley told SVG Europe, “as the free-to-air partner our remit is to try to appeal not just to golf enthusiasts but also to a wider audience. So we try to ensure that our programmes are not just a succession of golf shots, trying to make them interesting by telling stories and adding items we think will have more appeal, like the ever popular ‘Ken on the Course’ features which explain the game and the course in amusing style. On Thursday and Friday the BBC team is set with a challenge of providing a highlights show based on the day’s play – without knowing as the day unfolds, from 06:30 right through to close of play, which players are going to emerge and which stories will resonate the strongest with viewers. The commentary team commentates from 10am until 8pm on the golf as it happens, as the BBC feels the show is better if the commentators react as live, rather than post-dubbing a package recorded earlier. How does the team tell the story of each day’s play? “I’ll sit in our [CTV-provided] scanner creating a BBC feed from the world feed. That means cueing the commentators at an appropriate point close to the shot itself, making decisions along the way as to what’s likely to make the edit so the commentators can pick up cleanly, adding our own leader boards with music for Eilidh to voice – and adding additional shot graphics if the world feed has shown a graphic much earlier in the shot. “The edits are carefully planned,” said Bramley. “We have a team of four editors and two EVS operators. One editor will create the openings and features and three will be editing the golf and the EVS ops will be building the programme and replaying the live feed. “The one addition we have this year is an RF cam, supplied by CTV, so that anything Eilidh does out on the course is available instantly in the edit, rather than waiting for cards to be brought back from an ENG camera. “The other innovation we’ve been looking at is remote working,” said Bramley. “This is something that lends itself well to some sports, and we’ve had our galleries and post production remote in Salford this year for the Winter Olympics and Commonwealth Games. If you can reduce your costs and on-site footprint while not adversely affecting the quality of the on-air product, then it has to be considered. “However with golf highlights we would need to increase dramatically the amount of connectivity between the OB and MediaCity; clean and dirty world feeds, interviews, studio cameras, RF cameras, beauty shot etc. And then there’s the reverse feeds too: our own output for the commentators and a separate line for Eilidh voiceovers,” he said.